Buy weekly instalments of this classic book and develop your communication skills by working on one tip a week. Sign up for a PDF version and each tip is sent to you separately over 12 months by email. Not only is communication a dimension of almost everything we do but having great communication skills is a key ingredient for success. 52 Brilliant Communication Tips delivered to your inbox in weekly installments for 12 months is the perfect way to master your communication challenges in the year ahead. Read each new tip on the first day of the week and allocate a new learning focus to the next few days. Keep the PDF files with each tip on your desktop, laptop or e-reader. You will be amazed at the difference following these tips can make. 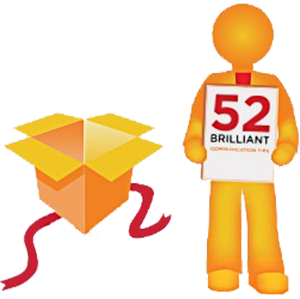 From managing your own inner voice to creating great first impressions and through the myriad of communication opportunities in their broadest sense – 52 Brilliant Communication Tips is just that – brilliant! Succinct and meaningful: highly recommended. Outlines the important elements of business communication in a very clear and coherent way. It’s perfect to consult and refresh one’s knowledge. There is no real substitute for individual coaching or attending a training programme in person. However, receiving one tip a week in PDF form can be a great way to kick-start awareness and get people working on their own development. If you would like to place an order for multiple people – for your colleagues, department or organization – please write to us on info@thetrainingbox.eu.com with your details and we will provide an individual quote.